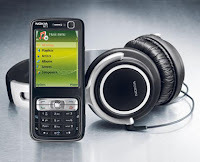 * Capacity based on 3:45 per song with 48 kbps eAAC+ (M4A) encoding on the Nokia Audio Manager. Capacity with 128 kbps AAC encoding is up to  songs. - On device photo editor (manual & automatic) and video editor (manual). - Tag images automatically with capture location and show on a map where they were captured. - Nokia XpressPrint solution – online printing service or direct printing via USB, Bluetooth connectivity (BPP), WLAN (UPnP), from compatible memory card. - OMA DRM 2.0 support for music. - Digital music player: supports MP3/ AAC/ AAC+/ eAAC+/ WMA with playlists, equalizer and album art. - Synchronize music with Windows Media Player 10 & 11. * The service is available free of charge, although any data transferred over the network will incur charges from your network operator. To check the availability and cost of the service, contact your network operator or service provider.